Warlord Games now have support packs for their 28mm Bolt Action Fallschirmjager figures. The Fallschirmjager (German Airborne troops) performed the first airborne invasion when they assaulted Denmark on the 9 April 1940. They followed this success up with further successful air landings of Norway and the pyrrhic victory of Operation Mercury in taking Crete. Ensure your German troops are well equipped with Warlord Games' range of support packs, including the 81mm mortar and MG 42. As the old adage goes "Soldiers find things...". True to form, the Bolt Action Fallschirmjager with Looted Weapons have...ahem...liberated some arms from their defeated enemies. All of these support packs are now available to order from the Warlord Games Webstore, or on the shelves of your nearest quality independent games store. Jim has a cool Modern Naval Wreckage Set in Jim's Lab. 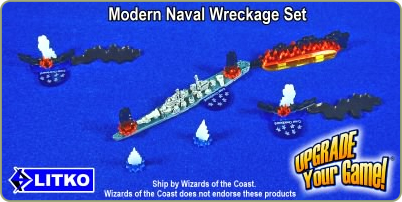 The set includes markers for crew overboard, oil slick, battleship sunk, flaming barriers and others... The set includes many multi-part multi-color markers and retails for $29.99. In July, there will also be a price change on our product. Like everyone, we are forced to react to market conditions, and as such, we have done a critical analysis of our pricing. Starting July 18, new prices for Wyrd products will go into effect. We wanted to give you advance notice so that you have the ability to make any purchases you were planning at the old prices. Lastly, go out and support your LGS. From July 1st through July 14th, if you purchase $75 or more of Wyrd product from your favorite local gaming store and send us an electronic copy of the receipt as proof, we'll send you a free Gremlinette! Pulp Monsters have posted a new preview of the changes to the printed version of the Pulp City superhero skirmish rules. This time looking at Trump Traits. Ganesha Games have posted a series of photos from Origins 2010 including many of their demo tables but also photos from the show floor as well. 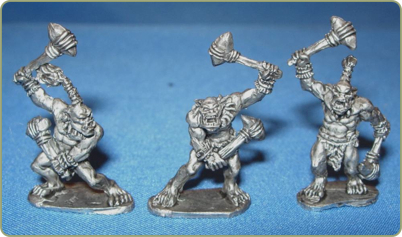 Pulp Monsters have posted photos of painted samples of their Le Murtiple miniatures for Pulp City. Le Murtiple will be released in July along with Silverager. In my post last week, I showed off two new figs from Web, Cardiac and Carnage. Given the fantastic reaction that I received on FaceBook and through email, I think we chose two good figs to start off the previews. How do you top those two figures? Well, today, I’m going to show you FOUR figures. Why show you four figures? Today’s preview article (and I hope the others that I write as well) is intended to give you a look through our eyes as we create a HeroClix set from the ground up. Last week, I illustrated how a set’s theme is selected, and the "blue sky" thought-process that goes into initial set design. Once we arrive at a theme, a new set of challenges and opportunities await the design team. We know what theme we want to explore, but we need to make the setlist sing. All are now available for ordering in the Dragon Forge Store. Also, from now through the end of July we will be running a "Can't Make It to Historicon" sale. All items will be 20% off, with the exception of buildings and SPACE01 and SPACE02. Please just send me an email at splinteredlightminis@earthlink.net with what you want to order and I will send you a paypal invoice with the sale price. We are very sad we will not be able to make it to Historicon this year but family obligations (my granddad is turning 90 and my grandma is turning 85) the same weekend keep us from attending. Also, please note that ORC10 is not yet available but should be at the end of the month or early in August. Wargames + Miniatures have received stock of the latest releases from Dwarf Tales. 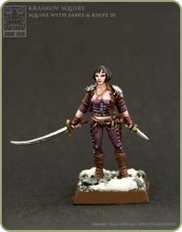 From their announcement: Two new miniatures have been released from Dwarf Tales Miniatures. The miniatures are for the Kraakov faction and the releases are: Kraakov Hussar on Foot 03 and Kraakov Squire 01. 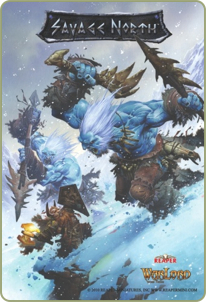 Wargames + Miniatures being the UK retailer for Dwarf Tales Miniatures, have added them to our webstore at www.wargamesandminiatures.co.uk Both miniatures priced at £5.65 each plus shipping. The Ralgard Fleet is soon to be released and what you can see below are the Statistics for the first three ship types: Frigate, Cruiser and Battleship. Summer is already here and the Rackham Store Team is working on the coming sales. From June 30 to August 3 2010, get 15% to 70% off a huge selection of products. Army Boxes and last new releases from both Confrontation and AT-43 included! It’s a great opportunity to boost you armies or to get your hands on new ones at attractive prices. Games Workshop have updated their 40K FAQ and Errata page with new FAQs for the Blood Angel and Tyranid armies. Martin Gibbons, author of Warhammer Ancient Battles, has written an errata and FAQ. You can find this as a downloadable PDF in the errata section. Fantasy Flight Games is reporting that Battle of Westeros is now available for sale. Welcome to Episode 8. After digesting 5 Warmachine faction books, we ruminate on the state of the 5 main factions, with some Mercs sprinkled in. We also begin the call for Speed Round questions. So give us a listen and send us a question. The podcast is available on iTunes, as well as on our site, www.theprimegeneration.com. We can be reached via email at theprimegeneration@gmail.com. 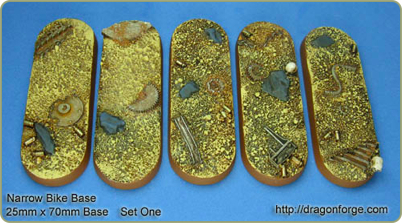 The latest 10mm Napoleonic release from Redline is designed for use in the early period of the Napoleonic wars. Here is a pack of 30 French line infantry with predominantly bicornes on. There are up to twenty different variants in a pack with a variety of head and arm poses, mixed equipment and differing headgear including pokalem and bonnet. The pack contains 30 figures including an officer, standard bearer and two different drummers. Redline will be releasing more in July including Austrians in helmets in two poses, Austrian grendiers in march and advancing poses and Austrian artillery crews. In this episode the guys talk about the upcoming So Cal Smack Down Miniature Gaming Convention being held in Anaheim California over Labor Day weekend in 2010. Pat talks about his recent attendance of the much-debated Conquest L.A. GT held on June26th and give his honest review. Both of the guys discuss some of the results (and discoveries) of games played using WHFB 8th Edition rules, which might be very surprising. As Always, enjoy the show. Brückenkopf Online have posted photos of the metal figures from the Warheads game. Since the release of Urban Mammoth's new Fantasy RPG/tabletop system Warheads, there have only been pictures around of cad renders of the Warhead miniatures. Brueckenkopf Online shows for the first time pictures of the real miniatures. Scibor's Monstrous Miniatures have released a Dwarf figure enjoying his holiday free time. 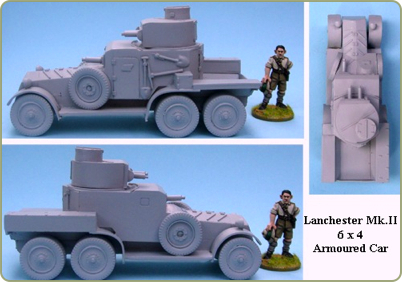 The original picture of the new Lanchester 6x4 Armoured Car made it look like the model was higher at the back than the front - this was the fault of my clumsy assembly, not the model, when I pushed the front axle out of shape as I added the wheels. Warlord Games have released the Pike and Shotte Scots Lancer boxed set. Now your Scots Covenanter force can add speed and punch with this great new Scottish Cavalry boxed set.